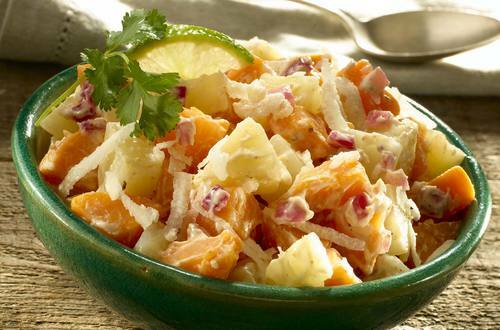 Make this easy jerk potato salad for your family. It's a crowd pleaser! 1 Cover potatoes and yucca with water in 4-quart saucepot, adding salt, if desired. Bring to a boil over high heat. Reduce heat to low and simmer 12 minutes or just until potatoes are tender. Drain and rinse with cold water. Arrange in single layer on baking sheet; let cool. 2 Meanwhile, melt Country Crock® Spread in 10-inch skillet over medium heat and cook onion with jerk seasoning, stirring occasionally, 4 minutes or until onion is tender. Stir in garlic and cook, stirring frequently, 1 minute. Stir in lime juice. 3 Combine cooled potatoes, onion mixture and remaining ingredients in large serving bowl. Chill, if desired.